For now pre order is welcome, entrance. Unlock Wall Crawler inner beast with supercharger tech. Wall Crawler is max output 80w full kit used one extra piece of 18650 cell. It has top replaceable coil designed for the tank. HOTSWAP TECH, makes coil replacement a walk in the part: simply just pull out the old coil, and plug in a new one, no other maneuver required. It has big colorful screen applied on the MOD. To bring user experience to the next level, the new Wall Crawler kit is fitted with a 1.3 inch full color high-definition TFT screen, contemporary user interface displaying all vaping details, and is supporting multiple language options. Wall Crawler kit is a lightweight, compact, and stealthy piece of technology that fits right in your pocket. It is a perfect on the go vape kit specially designed to be vaped anytime and anywhere, for those who are energetic, active, and for those who like moving and jumping around (preferably not on buildings), or for those who like sitting at some quite corner observing other people's daily go-abouts, and maybe sometimes lending a helping hand to those in need, without trying to be a superhero. 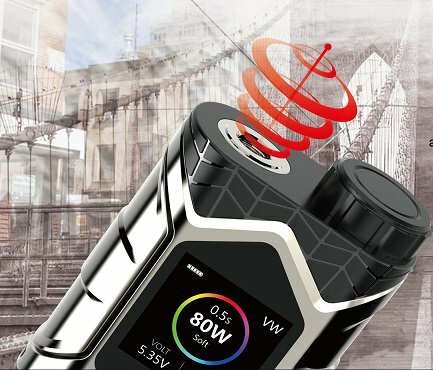 How fast the Vaptio Wall Crawler vape MOD start! Have a check on it, only 0.005 seconds from 0 to Max. Vaptio values user experience as one of the top factors why a prodct would succeed. 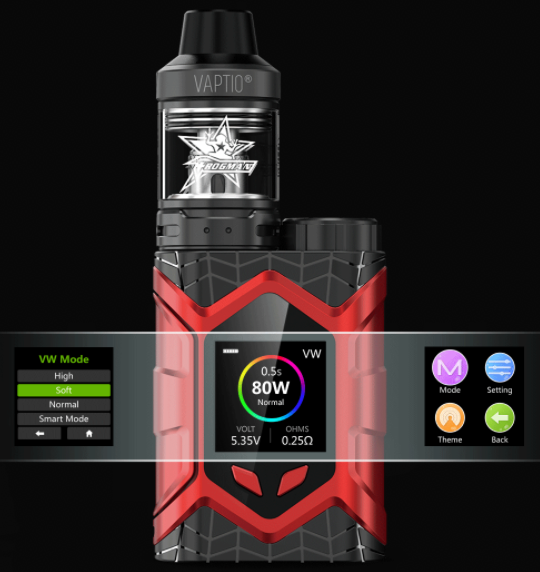 To bring user experience to the next level, the new Wall Crawler kit is fitted with a 1.3 inch color high-definition TFT screen, contemporary user interface displaying all vaping details, and is supporting multiple language options. always being there for you keeping you away from harmfulness. to advise a young, innocent, and somehow reckless nephew. advises vapers when it is time to replace the old battery. 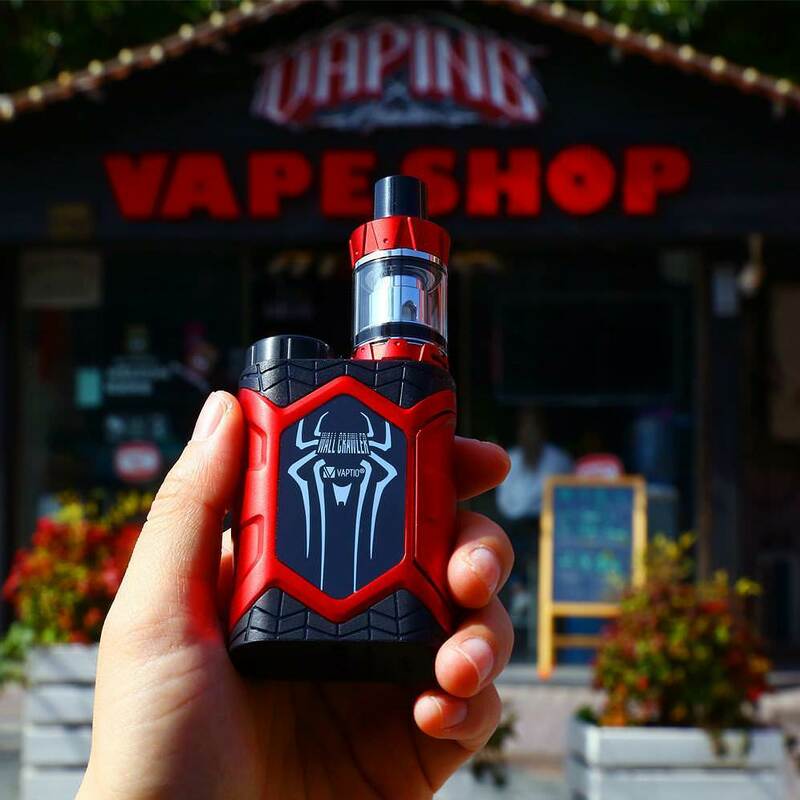 Do you find the Wall Crawler at Vape shop near you? It already presents at many shops. Just a little later to be born for your guys who love it.